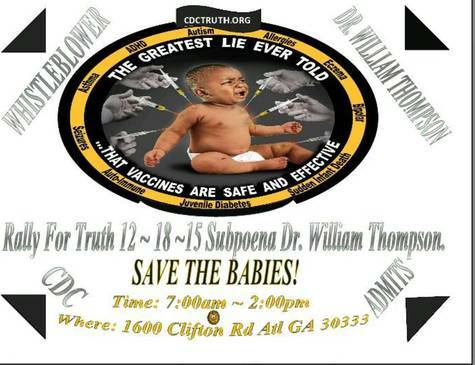 On Friday December 18, 2015 The CDC Vaccine Justice or Else Movement will hold a rally at the CDC Headquarters in Atlanta GA from 7am to 2pm EST. First, we will be protesting because we are in danger of losing our right to make critical decisions about our children's health concerning vaccination. Whether you are for or against vaccinating, it should still be citizens right to choose what happens to their child medically. California recently passed a law which made vaccines mandatory for children and for many adults who work with kids. Furthermore, Congresswomen Frederica S. Wilson introduced legislation in May 2015 into Congress which will make vaccines mandatory throughout the US. We need to let them know that we OPPOSE HR 2232 (Vaccinate All Children Act). Dr. Thompson’s admission has caused quite an upheaval in the Black community, where autism rates are twice as high as for white communities and 50% higher for Hispanics. https://www.autismspeaks.org/science/science-news/regressive-autism-reported-twice-often-among-african-american-children. We will stand up for our babies who are our future. We will not tolerate anymore vaccine tyranny and violence from our regulatory agencies or Big Pharma. We stand united and we are not going away!!! Please join us on December 18th in Atlanta. We plan to have the largest rally in CDC history and shut down the CDC. The CDC Vaccine Justice or Else Movement is an organization created to protect our children against harmful vaccinations. The CDC has done enough damage that has resulted in thousands of children having autism and other mental defects. The pharmaceutical companies are full of greed and deceit. We as parents can't allow the CDC to lie to us about the safety of our children. Join us and take a stand for the future of our children.